Full body performance capture is a promising emerging technology that has been intensively studied in Computer Graphics and Computer Vision over the last decade. Highly-detailed performance animations are easier to obtain using existing multiple views platforms, markerless capture and 3D laser scanner. 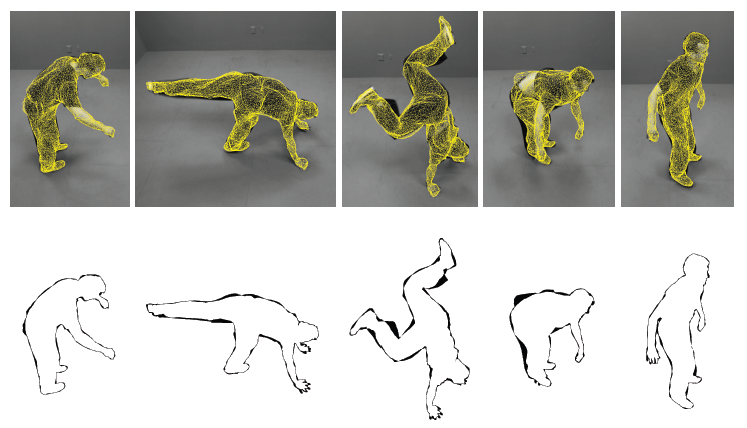 In this paper, we investigate the feasibility of extracting optimal reduced animation parameters without requiring an underlying rigid kinematic structure. This paper explores the potential of introducing harmonic cage-based linear estimation and deformation as post-process of current performance capture techniques used in 3D time-varying scene capture technology. We propose the first algorithm for performing cage-based tracking across time for vision and virtual reality applications. The main advantages of our novel approach are its linear single pass estimation of the desired surface, easy-to-reuse output cage sequences and reduction in storage size of animations. Our results show that estimated parameters allow a sufficient silhouette-consistent generation of the enclosed mesh under sparse frame-to-frame animation constraints and large deformation. cage performance capture, mesh tracking, cage-based deformation, template-based processing interative mesh editing, linear mesh deformation, space-based deformation, data-driven deformation, performance capture, dense surface skinning.